We’ve been to the ThinkContent conference in London, but this was BuzzSumo’s first time to join the standing room only crowd for NewsCred’s signature event in Manhattan. I was unsure of what to expect from a one-day meet-up, but the conference delivered multiple insights at a quick pace. One theme dominated the sessions: ROI. Almost every presenter talked about the importance of tying content to business goals. Read on for a few other points that stood out to me. Shafqat Islam, Co-founder and CEO, Newscred, issued a clear non-verbal statement. 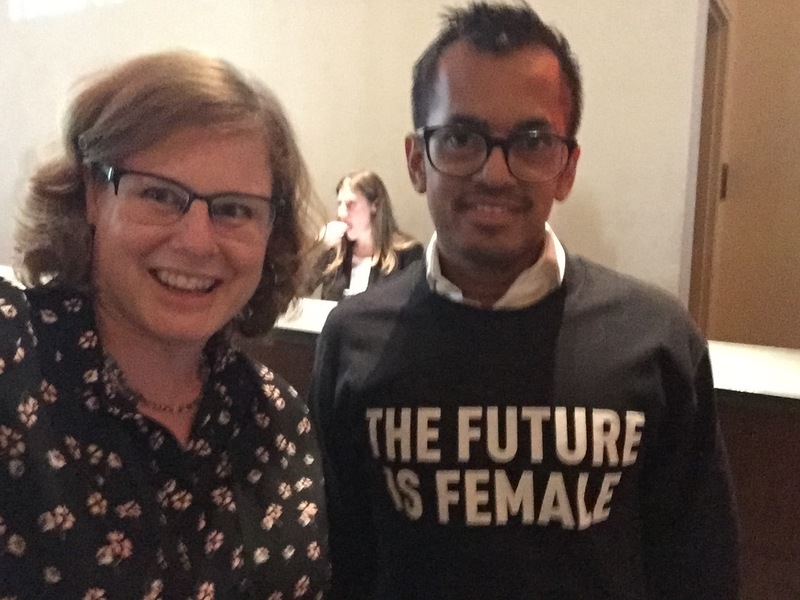 He took the stage for the keynote wearing a “The Future is Female” t-shirt. And he ended the day with a report on the percentage of speakers that were female and male. BuzzSumo values diversity. Our small team is 60/40 male to female, with the top spot held by a woman. Our parent company, Brandwatch has taken intentional steps to address gender equality, including a survey of salary levels by gender. As an original member of the Women in Content Marketing Facebook Group, which was founded to help women launch their speaking careers, I appreciated Shafqat’s transparence about the ratio of female to male speakers at his event. “If it’s great content, but it doesn’t drive business, it’s not going to be funded,” said Jenn Eldin, SVP, Global Head of Content for Citi. To rally the organization around content, you need to use data and fact-based arguments, including case studies and results. Doug Straton, Chief Digital Commerce Officer, The Hershey Company, agrees. “Content is king, but data is it’s queen,” Doug says. Use data to prove what content works and why. The challenge for content marketers has shifted from gaining buy-in for the tactic to demonstrating results, Shafqat says. 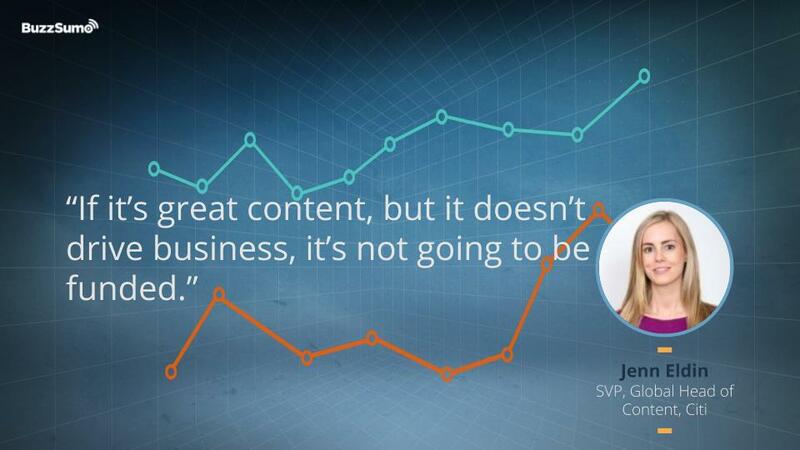 “Performance matters.” Content marketers need to tie their content to revenue generation. To get the C-suite to buy in to the power of content, you need a clear value proposition, says Karen Eisenbach, CMO, Voya. People want to talk about money and resources. You have to demonstrate results, and you have to align your content with outcomes, Karen said. But, don’t get hung up with having the perfect dashboard. Just start, Karen says. Get something on paper, and begin talking about that outcome. 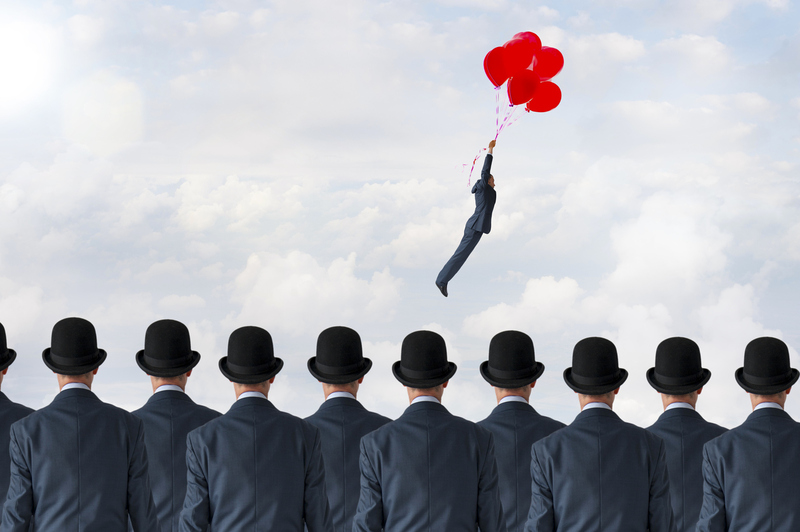 You want to demonstrate big value, but that will accrue over time. Grainger pivoted its content strategy from thought leadership and brand equity to revenue generation two years ago, explains Ray Pryor, Full Stack Content Marketer for the industrial supply giant. Their strategy included going back through all of their top of funnel brand awareness content and adding promo modules. Using last touch attribution, overall in 2017 content generated 12x ROI against cost of program. There are tools and technology available that make it possible to scale your content for global use. Take advantage of them! Citi’s goal is to repurpose more than one-quarter of their US content for international audiences. Vice, already active globally, plans to push further. “Africa is the next big thing for us,” said Dom Deport, Président International & Global Chief Revenue Officer, Vice Media. Connect the content you create with a broader vision for the brand, and don’t unnecessarily limit your sources of inspiration. Look outside your own content to publishers and competitors, and those outside your industry, Jenn says. Choose YOUR conversations; tell YOUR stories. I’ve heard a lot about reaching customers wherever they are; building personas that include a full set of leisure activities and interests. I’ve wondered at times if it’s all a bit much. Young people are navigating their lives through the lens of travel, food, and retail, says Rafat Ali, CEO and Founder, Skift. They have latched on to brands for how they live their lives, and they are looking for shared values and a sense of community. “People are looking for believable stories from the brands they care about,” Rafat says. In this climate, being small is not a deterrent. Small brands that are human focused and grasp the primacy of the individual consumer can tell these stories, Rafat says. They can present a human-powered, humane face to the world. For Vice, the focus is on generation Y and Z, Dom says. To keep their video story telling on target, they only use young videographers and young video editors. As a brand, Vice is committed to earning the trust of their audience, making an impact by deepening and extending their audience view of the world, and being absolutely unique, Dom says. The customer journey never ends, and the funnel didn’t adequately account for that, he says. It was too focused on the sales transaction. Content is no longer just marketing. 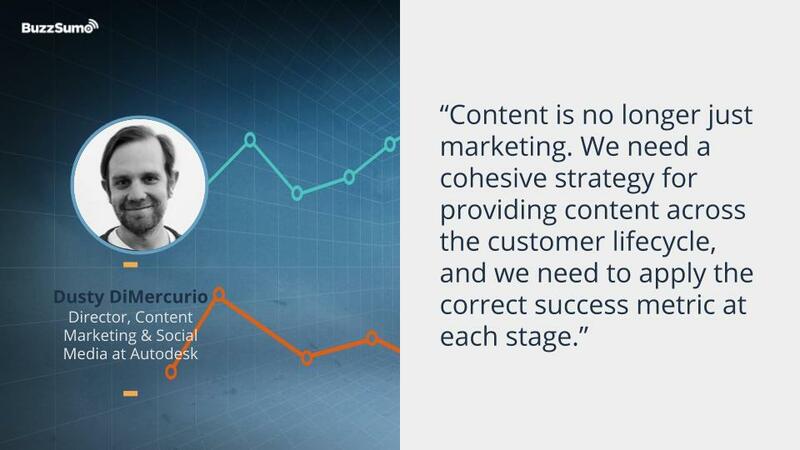 We need to have a cohesive strategy for providing content across the customer lifecycle, and we need to apply the correct success metric at each stage, Dusty says. For example, content that creates demand and attracts customers is measured by the number of new customers. While content designed to encourage customer adoption is measured by retention, and content designed for brand affinity is measured by earned attention. Content marketers can struggle to measure the impact of early stage content. This type of content tends not to have a clear, direct tie to sales, says Charity Stebbins, Content Director, Conductor (WeWork). The team at Conductor worked with a Harvard researcher to measure the impact of early stage content. Their research demonstrated that Content makes consumers 131% more likely to buy from brands that educated them. And that effect grew over time. Content is key. What makes us stand out as businees is customer services and content. Content is the business difference. The post What we learned at ThinkContent appeared first on BuzzSumo.